Jin Wang starts at a new school where he's the only Chinese-American student. When a boy from Taiwan joins his class, Jin doesn't want to be associated with an FOB like him. Jin just wants to be an all-American boy, because he's in love with an all-American girl. Danny is an all-American boy: great at basketball, popular with the girls. But his obnoxious Chinese cousin Chin-Kee's annual visit is such a disaster that it ruins Danny's reputation at school, leaving him with no choice but to transfer somewhere he can start all over again. The Monkey King has lived for thousands of years and mastered the arts of kung fu and the heavenly disciplines. He's ready to join the ranks of the immortal gods in heaven. But there's no place in heaven for a monkey. Each of these characters cannot help himself alone, but how can they possibly help each other? They're going to have to find a way—if they want fix the disasters their lives have become. Gene Luen Yang writes, and sometimes draws, comic books and graphic novels. As the Library of Congress’ fifth National Ambassador for Young People’s Literature, he advocates for the importance of reading, especially reading diversely. 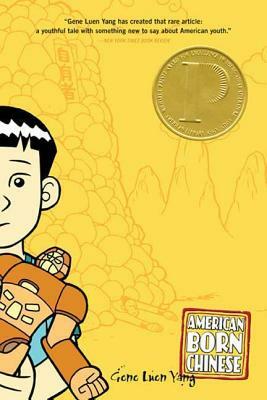 American Born Chinese, his first graphic novel from First Second Books, was a National Book Award finalist, as well as the winner of the Printz Award and an Eisner Award. His two-volume graphic novel Boxers & Saints won the L.A. Times Book Prize and was a National Book Award Finalist. His other works include Secret Coders (with Mike Holmes), The Shadow Hero (with Sonny Liew), New Super-Man from DC Comics (with various artists), and the Avatar: The Last Airbender series from Dark Horse Comics (with Gurihiru). In 2016, he was named a MacArthur Foundation Fellow.